So, the Mustang has finally arrived here in India? Yes, it has. This Mustang Fastback GT is officially in showrooms now. It’s usually to denote a body style where the roof slopes all the way to the rear bumper. While it is not exactly the the case here, Ford has borrowed the name as the new Mustang design is partly inspired by that line of thinking, just like the pre-80s models. Broadly speaking, Ford uses this naming nomenclature for the coupe, which is mainly the model it sells in the foreign market. Back home, in the US, there are convertible versions too. How different is this car than the one Ford sells in the US of A? Not very different apart from the obvious part that the steering wheel is on the right side. 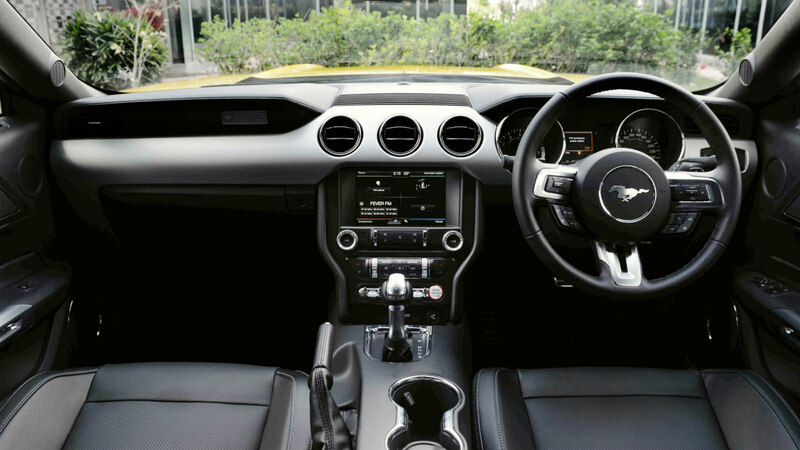 Under the hood is a 5.0-litre V8 which is the most powerful engine in the new Mustang range. This is not an all-new engine though but has been tuned for India. Rather detuned by around 20-odd horses to make it better compatible to the fuel quality we have. Nevertheless, it can still unleash a total of 395 horses at its peak. Couple that with 515Nm of torque and you are looking at a car that sits comfortably in typical American muscle-car territory. How fast does that make it? Massively fast. The sprint from standstill to 100kph is claimed to be just under 5 seconds. But we like the way this car propels itself like a sportscar with all that power going to the rear wheels rather dramatically. The Mustang is a very different kind of sportscar. For starters it is loud. Okay, not as loud as a deafening AMG or SVR but it sounds properly angry. Ford has not only stuck to being inspired by classic Mustangs of old when it comes to design but also maintains a bit of raw force like classic cult cars. 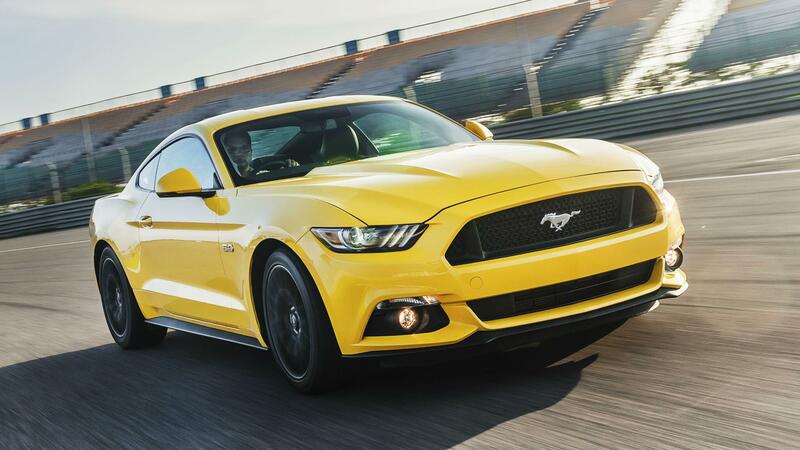 Compared to say, a Porsche Cayman or an Audi TT, the Mustang feels less clinical, yet it maintains a certain level of modernity in the way power gets delivered linearly and the way the six-speed automatic gearbox slick shifts the car. It isn’t buzzy but exudes a certain kind of brawny feel to the whole driving experience – think Vin Diesel? It can get the job done although it may not look very lean or feel light-footed. What about the cabin? Is it as good as the Germans? Of course, not. Interiors also very American here. While the German’s stress a bit more on luxury, Ford has just stuck to making sure it all feels sturdy and well built even if it may not exude opulence. But we like that bit. Which the Mustang is. Most everyday car comforts are built in – climate control, navigation, reversing camera, touchscreen multimedia screen. It even has ventilated seats at the front. Plus, there is a whole lot of gadgetry to play with. An all-new independent rear suspension is a major reason for the improved road dynamics. Interesting. Can you elaborate the last part? Firstly, there are four drive modes to choose from – Normal, Sport+, Race and Snow/Wet. As you see Ford envisions this car will be used for various purposes. And it has made sure you get that one-size-fits-all sort of car. Normal is good for daily use. Feel you can handle a bit more mayhem then upshift that ‘mode’ toggle switch on the centre dashboard to get into Sport+, which tightens up the steering and allows the engine to hold revs on the limit a bit longer. You can even get this done with the stick shift. If that’s not wild enough for you, there is Race mode. But we suggest try this on a track. The inbuilt computer will also time your laps. It can also give you acceleration and G-forces and other such figures which might be useful for a bragging session during a boys’ night out. I think I am sold. But what’s the price? 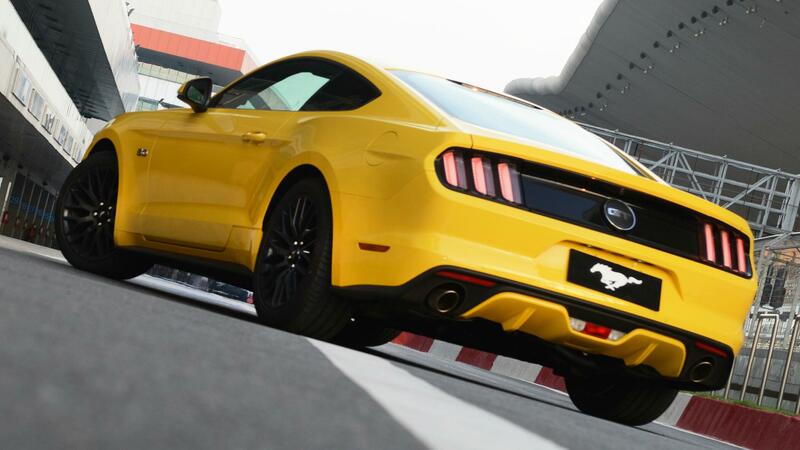 Ford has put a Rs 65 lakh (ex-Delhi) price on the Mustang. That’s roughly Rs 80 lakh on-road. Of course, the final price also depends where in India your purchase the car. Speaking of which, considering the special tooling requirements for this iconic car, the Mustang will initially be sold only in Delhi and Mumbai. Of course, the plan is to make it available across all the cities Ford currently caters to, eventually. A lot of interest during the initial showcase at the Delhi Auto Expo earlier this year means expect a waiting list. But considering this is going to be its first foray into proper performance car segment, Ford may not want to lose out on the momentum. Sources tell us that the initial lot of Mustang customers won’t be restricted to just celebs and the high society but also include current customers who have shown interest. Considering Ford isn’t typically known for luxury, isn’t it a tad expensive? What could be my options? In sportscars, the most immediate competitors would be the new Audi TT or even the Porsche Cayman. The Mustang sits right in the middle. But you may appreciate the fact that this is a bigger car, has presence and sort of bridges the gap between the good old days and modern car culture. Plus it has performance to boast. To put it in perspective, this is almost as big as a BMW 6 series Gran Coupe and has performance close to its M version, for more than half the price. It isn’t as forgiving as the cars mentioned above if you mess up. 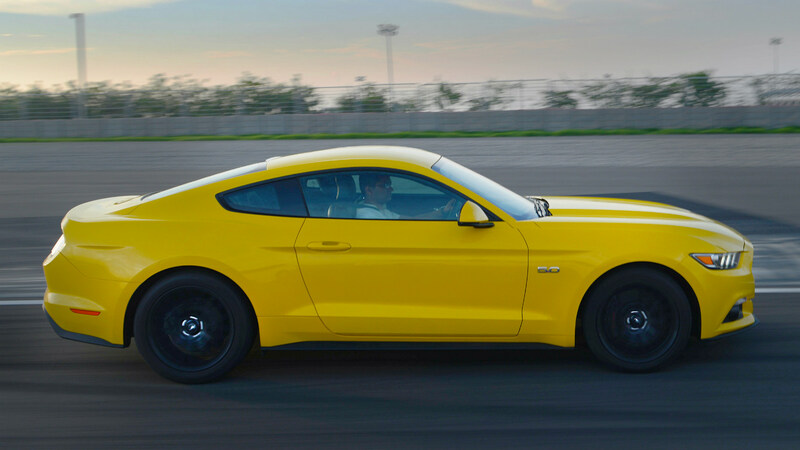 So, go for it if you always wanted one and can handle all that testosterone the Mustang will bring along. Also, the attention.